It was time to turn our bike away from the coast and head off into the interior. We had a fabulous time up the east coast and met up with loads of lovely people but this land is big, very big and we had to get down to Uluru (Ayer’s rock) before we headed up to Darwin and across. It will get much hotter in the next couple of months before summer is even here so we had to step up our pace a bit. We had the joy of riding the Gillies Highway again on our route to Undara and its lava tubes. We stopped briefly at Herberton with the intention of exploring the historic village but cost and time put us off so we made tracks directly to Undara stopping in Ravenshoe to look at its steam train you can even sponsor a railway sleeper. The tour at Undara was expensive but it’s not something you find every day and we could camp in the grounds. After erecting the tent we had an exclusive tour for two, our guide was very informative and we even ended up wading in cold knee high water in order to see deeper into the flooded lava tubes, the water has created patterns on the walls which our guide showed us. The park contains the remains of the earth’s longest flow of lava originating from a single volcano. The word Undara is aborigial in origin and means a long way. The volcanic activity that formed the tubes occurred approximately 190,000 years ago and the volcano Undara expelled massive amounts of lava onto the surrounding Atherton Tableland. In total it was estimated that over 23 billion cubic metres of lava that was released covering an area of 55 km2 Bayliss Cave is the remains of a lava tube that was once over 100 kilometres (62 mi) in length. The cave itself is over 1,300 metres (4,265 ft) in length, 11 metres (36 ft) high and 22 metres (72 ft) wide. The tubes were formed when the lava on the surface cooled whilst molten lava continued flowing underneath, this molten lava melted everything in its path creating the tubes we see today. We saw lots of wallabies in the camp ground as well and managed to get a picture or two, we see lots on the roads but never get chance for a photo. We had a great meal of lamb chops and potatoes that night mainly because we can now buy meat for two days and put it in our fridge so long as we are mostly riding. The campsite put on a talk each evening round the campfire from one of the guides, this evening’s theme was wings and things. We learnt the names of some of the birds we have seen and it was great to have a fire. From here on in we had many kilometres to cover before Alice Springs. We rode all day and watched the countryside change from rocky tree plains to thick dried grass to flat savannah before arriving at our free camp for the night. 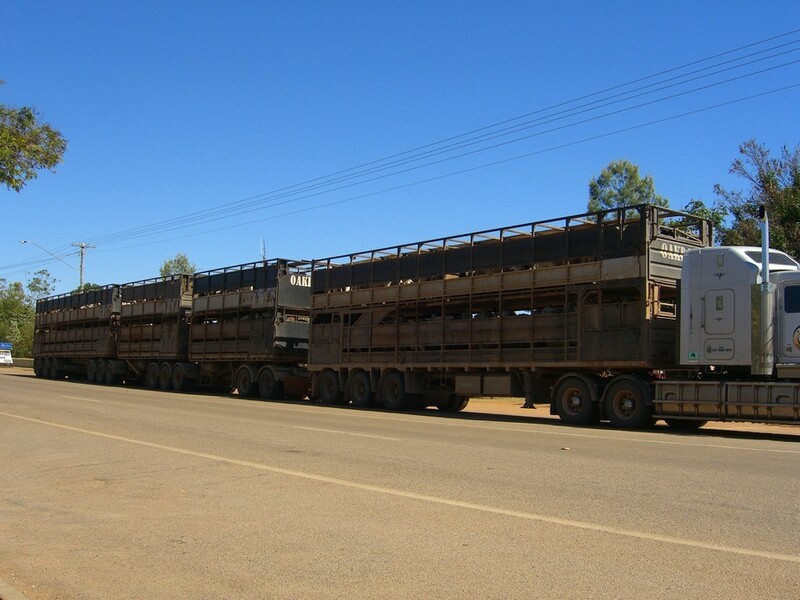 We now encountered the road trains some up to four trailers long, along with the other road hazzards including emus and kangaroos running in front of us. Might is right here and the road trains win every time, besides which the edges of the roads of often steeply cambered and they can’t get off. This means you have to quickly scrub off some speed and dive onto the dirt to get out of their way. The ground is hard as hell out here and pegs take a pounding each time the tent goes up. We even changed time zones as we headed west and had to adjust our clocks by a bizarre 30minutes. The rear wheel had been making a noise so Kev played safe and changed the wheel bearings in the scrub before we left. After another day of full traveling we pulled up in another free camp this time we chatted to a passing BMW rider who was on his way back to Melbourne. The scenery is changing all the time and some areas are being deliberately burnt to stop bushfires later some we not sure about. We encoutered a lorry driver who had a buffalos head he was taking home to make into a trophy. Now officially in the Northern Territory we are getting a measure of the vast distances we have to have to cover as after another full day of travel we camp up in yet another free camp but this time we have a bit of interest. The Devils Pebbles a rocky outcrop made of granite we took a wander round before Kev changed the bevel box oil as the noise is still there and wasn’t the wheel bearings. Next morning we detoured to the Devil Marbles or Karlu Karlu a larger version of the pebbles and much more photogenic.These were giganitic rounded granite boulders, some say the Aborigines believed the site to be eggs of the mythical Rainbow Serpent. In reality many diverse traditional ‘Dreaming’ stories (none of which are about serpents) intersect at and around Karlu Karlu, hence its great importance as a sacred site. 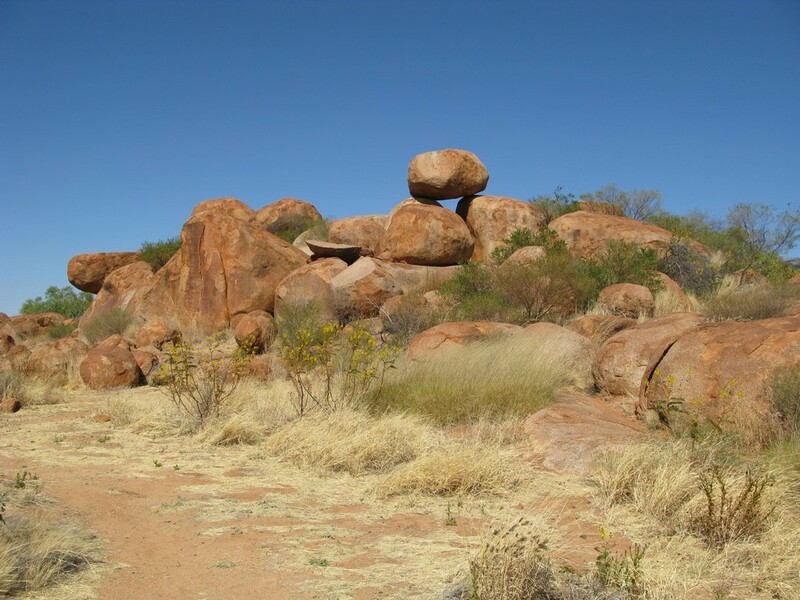 The devils marbles are made of granite which was once molten magma (great word magma !) they were originally covered by a layer of sandstone which over millions of years eroded away exposing the huge blocks of granite. They themselves continued to be weathered by sun, wind and rain rounding off the corners and splitting some of them in two. We are back into interesting country now and stopped around lunchtime at Barrow Creek initially just for fuel it was the site of an old telegraph station and the building has been restored. Kev had been wanting a grease gun for the wheel bearings and after asking the bar manager (all fuel stops nearly always have a bar attached) we struck lucky. It was another memoriblia pub and the walls were adorned with all sorts (including a guzzioverland sticker now). It was nearly lunch so much to the amusement of the local aborignals who were sitting around drinking VB’s (local beer) I ferried to and fro from the bike various bags and proceeded to make cheese, tomato, lettuce and salad sarnies whilst Kev grovelled under the bike greasing the wheels. I managed to photograph two of them with one of their works of art they sell to tourists. All of this encounter was without words and we wondered what they made of us but when we left they all waved enthusiastically to us. We overnighted in Ti Tree Australias most central roadhouse with camping. Alice Springs is not too far now and we stopped at the Tropic of Capricorn next day for a photo before we arrived in town. We made it a brief stop for supplies and pushed on to Uluru arriving just in time to watch the sunset. We had to stay at Yulara the only place you can camp there. They have the monopoly and it’s expensive but a well equipped nice site. It was worth it though, Uluru is vast, humbling and beautiful. The first image is Mt Connor the rest Uluru. We woke before dawn and raced to the sunrise viewing area to join the other hordes watching it rise over Uluru, it was really magical and worth the 5am alarm. After breakfast in the car park we set off on the almost 10km walk around its base. Although still way too early for sane people we still walked a good portion of it in full sun and saw its ever changing colours. We took a squintillion photos so we’ve whittled it down a lot!!! You can use the arrow keys on your keyboard to scroll through them. Next stop the Olgas and Kings canyon. This entry was posted on September 14, 2011, 7:10 am and is filed under On The Road. You can follow any responses to this entry through RSS 2.0. You can leave a response, or trackback from your own site.